CueMix FX's flexible dynamics processing includes a high-quality conventional compressor, plus a leveling amplifier modeled after the legendary LA-2A™ optical compressor. 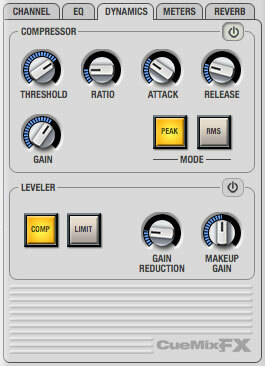 CueMix FX offers a conventional compressor with standard controls for threshold, ratio, attack, release and gain. Adjust the threshold graphically while viewing accurate, long-throw metering in the compressor section of the CueMix FX software. The CueMix FX Leveler™ is an accurate model of the legendary Teletronix™ LA-2A™ optical leveling amplifier, known for its unique and highly sought-after Automatic Gain Control (AGC) characteristics. Conventional compression and limiting with threshold, attack, ratio, release, etc. do not apply here: the heart of the LA-2A is the T4 opto-coupler, a photoelectric device with almost magical (signal dependent) self-adjusting behavior that makes optical compressors the tool of choice for smoothing out just about any audio material, from vocals to bass guitar to full-program mixes, without destroying perceived dynamics. The Leveler faithfully models the LA-2A using the on-board DSP with 32-bit floating point precision. Its controls match the front panel of the original LA-2A: Gain Reduction and Makeup Gain knobs, along with Limiter/Compressor buttons.